You know how they say whatever you eat while you are pregnant, your baby will love? I ate a TON of spaghetti while I was pregnant with my twins. I pretty much ate spaghetti everyday. When I went into labor, I requested my husband make me a huge spaghetti dinner before we went to the hospital because I knew they wouldn't let me after we arrived. It was so good. And now, my twins adore, crave, request spaghetti at least twice a week. Rarely do I make a homemade sauce - typically it's boiled noodles and sauce from a jar. But when I made this Shrimp Penne Pasta dish from Pioneer Woman recently, I learned that making a simple tomato cream sauce was, well, simple. And now, I can't stop making it! To adapt this to our Sunday lunch after church...it takes me all of 5 minutes or less to whip up this sauce that is 1000% better than from a jar. One 15 oz. can of tomato sauce. 3 cloves of garlic. Salt and basil to taste. Add heavy whipping cream...I eyeball it but typically I add about 1/4 - 1/2 Cup. Yes, heavy whipping cream. Dr. Oz says it's actually very good for you and not to worry about the calories. I gladly listen. Last Sunday, I also added some garden tomatoes and a few meatballs. Zucchini is coming out of our ears at the moment. Our garden is bursting with loads of zucchini's! I bet yours is too, right? The Gardener loves to make zucchini fries for our meals...I'd tell you how to make them but he won't tell me. They are to die for! He cuts them into long pieces like fries, there is olive oil and parmesan involved but he does something else to it that he says is his secret ingredient and then grills them. Mouth watering! But when it's my turn, I use this yummy recipe from Ina. Onions, butter, zucchini, parmesan. 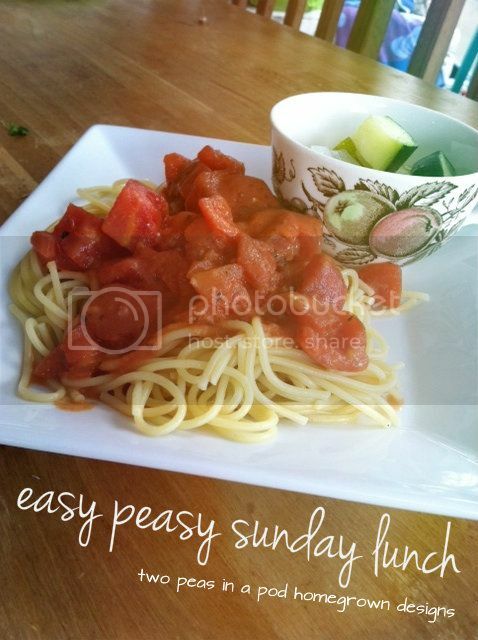 The kids can not get enough of it - serve in a cute little teacup from the thrift store with your spaghetti...easy peasy Sunday lunch. The onions and the parmesan are absolutely delicious! Eating is one of our favorite family things to do...while we eat, we usually are talking about what we are going to eat next. Love good food. Good whole healthy foods. What easy lunch ideas do you serve your family on the weekend?